Home news Jimmy Carter offers peace talk with North Korea's Kim. Jimmy Carter offers peace talk with North Korea's Kim. “permanent peace” to the Korean peninsula. In an intervention that is likely to irritate Donald Trump, the 93-year-old former president told a South Korean academic that he was willing to travel to the North Korean capital if it meant preventing war. 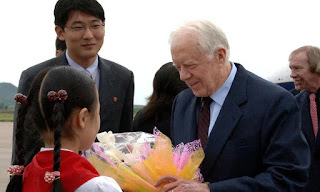 “Should former president Carter be able to visit North Korea, he would like to meet with North Korean leader Kim Jong-un and discuss a peace treaty between the United States and the North, and a complete denuclearisation of North Korea,” Park Han-shik, a professor of international affairs at the University of Georgia, told South Korea’s JoongAng Daily newspaper. Park said Carter told him during a meeting at his home in Georgia at the end of September that he wanted to “contribute toward establishing a permanent peace regime on the Korean peninsula. “He wants to employ his experience visiting North Korea to prevent a second Korean war,” he added. Carter’s recent comments on North Korea have angered the White House, which last month reportedly asked him not to speak publicly about the crisis amid fears he was undermining Trump, who refuses to entertain any form of rapprochement with the regime. Media reports said a senior US state department official had visited Carter at his home to pass on Trump’s request. Carter’s conciliatory stance sits uneasily with attempts by the Trump administration to intensify sanctions against Pyongyang and threats to use military force if the US or its allies are threatened by the regime. Carter, however, does not appear to be listening to his successor in the White House. In an opinion piece in the Washington Post last week, he described the North Korean situation as “the most serious existential threat to world peace” and implored Washington and Pyongyang to find a peaceful way to defuse tensions and “reach a lasting, peaceful agreement”. Carter said all the North Korean officials he had met, including the former leader Kim Il-sung, had told him that all they wanted were direct talks with the US to negotiate a peace treaty to replace the uneasy ceasefire reached at the end of the 1950-53 Korean war. Attempts to pressure the North into abandoning its nuclear and ballistic missile programmes will fail for as long as the regime believes its survival is at stake, Carter wrote. Carter’s brand of gentle diplomacy has won concessions from the North Koreans before. In 1994, during Bill Clinton’s presidency, he persuaded Kim Il-sung to freeze his country’s nuclear programme in a deal that may have averted conflict with the US. In August 2010, he secured the release of Aijalon Gomes, an American who had been sentenced to eight years in prison for entering North Korea illegally. Park, who helped organise the 1994 and 2010 trips to North Korea, said he had communicated to Pyongyang Carter’s wish to lead a US delegation to the country. “We have yet to get answers from the North Koreans, but I’m sure they’re giving it deep consideration,” Park told the Yonhap news agency. Even an unofficial delegation led by Carter would need to be approved by the US government following the recent introduction of a ban on American citizens traveling to North Korea.